 Most babies start to sit up between around 4 – 7 months.  By the time they’re around 8 months old, most babies can sit up unaided.  Sit behind your baby to give them lots of opportunities to learn to sit up.  If you have cushions to protect them when they topple supervise them to prevent suffocation.  When your baby can sit up unaided they can use a high chair.  Sitting up completely unaided is one of the signs of readiness for weaning.  Once your baby can sit up it opens up lots of opportunities to reach and explore things in their hands.  Can I help my baby learn to sit up? Yes, you can. 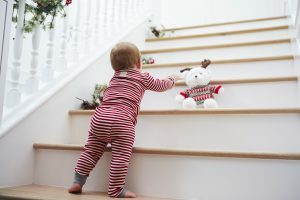 The best way to help your baby learn to sit behind your baby or surround him with nice soft cushions or a soft surface so when your baby topples over (which he will, and it looks so sweet!) they won’t hit any sharp surface or get trapped. Always supervise your baby when they are learning to sit up unaided as they can collapse and be trapped in uncomfortable and potentially dangerous positions. “Tummy time” games will help your baby develop his back and neck muscles generally.  If my baby can sit up, does this mean he’s about to crawl and walk? Sitting up is one of the milestones between lying down and starting to be able to balance, pull up and cruise so it’s part of the journey. When you baby can sit up unaided it means his muscle strength is growing and his fine balancing coordination is developing, which is all needed before he can crawl, cruise or walk. From a sitting position, your baby will probably learn to reach forward and support himself on his arms. As his arms and necks gain strength, he can support himself in this position for a while. From this position, all it takes is him to push off with his legs and he’s crawling. However, this is easier said than done and your baby will have to go through the frustrating stage of getting stuck in a crawl position either unable to move or going backwards!  Do I need to safety proof my house at this stage? Babies develop so quickly you need to be safety proofing your house ahead of them hitting developmental milestones. So you need to safety proof your house really from the time your baby is about 12 weeks old and trying to roll over. You’d be surprised how far and quickly your baby can roll about – even before he can sit or crawl!  Should I worry if my baby isn’t sitting up? If your baby isn’t sitting up by around 8 months, then it’s worth getting him checked over by your family doctor. It’s probably nothing to worry about but in rare cases, it can be a sign of a developmental problem. Of course, if your baby was born premature, you may expect them to sit up unaided later than their full-term peers.